First is a hyper-coaster named "The Kraken." This coaster is a twist you every which way type, doing; loops, cork screws, bat-wings, and emmelman loops. It also drops you a few times. A decent thrill ride! In front of the ride there is a practice seat for people (who have recently lost 100 lbs for the sole purpose of fitting in roller coasters) to try out and see if they fit before they wait in a long line... I didn't fit. 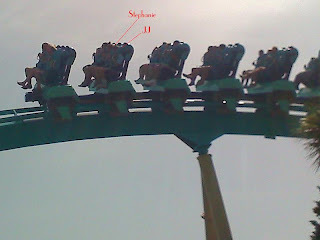 I sent JJ and Stephanie on the ride while I waited. They rode it about a dozen times before we left. Second, "Journey to Atlantis," a half boat/log flume, and half roller coaster. It has a great drop, some twists and turns, and promises to get you soaked. I fit in the seat and it fulfilled it's promise (6 times). The kids liked this one too and rode it about 9 times. Sort of a cross between Splash Mountain and the Matterhorn... Not bad. Third... 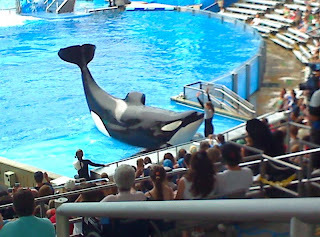 The girl in the picture got to ride on the nose of that killer whale (Shamu). It propelled her across the water's surface at about 10mph it took her to the bottom of a very deep salt water pool, and then shot her about 30 feet in the air as she stood on it's nose. 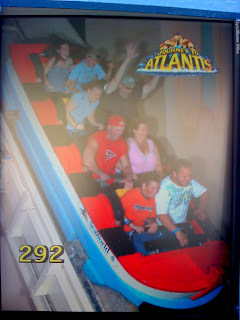 This ride is also a wet one, but the thrill comes from standing on the nose of the baddest predator in the ocean. Even the great white sharks leave this bad boy alone! As far as my fitting on/in this ride... Yeah I bet I would, but no thanks.